Recognised antioxidant, anti-inflammatory and cardio-protective effects. Observed benefits for prostate problems. Quercetin, a flavonol found in various vegetables and herbal medicines, has considerable biological activity, possessing anti-cancer, anti-allergy and antioxidant effects. However, use of quercetin has been limited by its insolubility in water and hence low oral bioavailability. Isoquercitrin (IQC) has greater availability but by far the best option is another water-soluble form: enzymatically modified isoquercitrin. Given that water solubility is enhanced by glycosylation (attachment to a sugar), scientists have evaluated the bioavailability of several orally-administered quercetin glycosides. Of the various types of quercetin, the enzymatically modified form, isoquercitrin (alpha-oligoglucosyl isoquercitrin, EMIQ®), has been identified as having the greatest bioavailability. IsoQuercitrin, 17 times more bioavailable! Isoquercitrin EMIQ® is derived from another flavonol, rutin, through natural enzymatic modification. As a result of modifications to its structure, Isoquercitrin EMIQ® is, up to 12 hours after ingestion, 17 times more bioavailable and more concentrated in blood, compared with simple dihydroquercetin. In vitro studies have shown that two enzymes, lactase and maltase-glucoamylase, play an important role in the rapid intestinal hydrolysis and absorption of this modified form, and subsequent release of the quercetin therein. 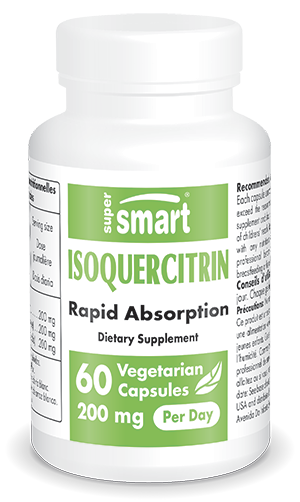 As with most flavonoids, quercetin and isoquercitrin IQC are particularly recommended for digestive or respiratory allergies including asthma and hay fever, as well as for eczema and urticaria, when taken alongside L-ascorbic acid and zinc. In a 2009 double-blind study of 24 subjects with a pollen allergy, eight weeks’ treatment with Isoquercitrin EMIQ® significantly reduced eye problems (itching, watery eyes, congestion), with improvements observed from the first week, and peaking during the sixth week of supplementation. Primarily a preventive agent, Isoquercitrin EMIQ® should be taken in the morning on an empty stomach or in between meals, at a daily amount of 200mg divided into two doses. Supplementation should begin at least two weeks before the arrival of the pollen season and continue until it is over. It can be happily combined with the use of conventional antihistamines; indeed, some studies have found that those who take standard medication alongside quercetin report greater improvements in their symptoms. Studies have also revealed that Isoquercitrin EMIQ® lowers systolic hypertension in rats, probably as a result of an increase in endothelial NO. Other research has demonstrated anti-atherogenic effects. EMIQ was found to suppress the aortic atherosclerotic lesion area and reduce atherosclerotic plaque lesions in the aortic sinus. In a study on rats, the administration of Isoquercitrin EMIQ® suppressed the spread of preneoplastic liver cells. Ongoing clinical trials suggest that taking Isoquercitrin EMIQ® is associated with a reduction in overall body fat, a more balanced distribution of fat zones and a decrease in subcutaneous fat zones. In mice, this significant lipolytic effect resulted in weight loss, a fall in overall volume of visceral fat and hypertrophy of adipocytes, even when subjected to a high fat diet. The body of evidence on this substance shows it to be free from toxicity; indeed, it has been Generally Recognised As Safe in the United States since 2003. It is authorised for use as a food additive in Japan and is used as an antioxidant in many products. Other ingredients: Acacia gum, rice flour. EMIQ®, Theravalues Corporation, USA.